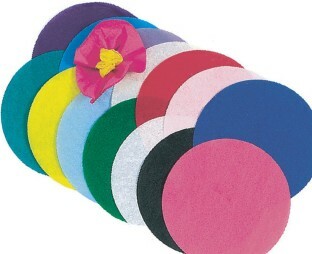 Tissue Paper Circles Pack, 4"
smaller than anticipated but they work well for small crafts. Next time we will just get full tissue paper and cut them as needed it will end up being less money. Use this for a kids workshop at work. We made patchwork elephants using milk jugs. With a glue water mixture we brushed the glue mixture over the tissue paper onto the jug. The paper held up well. Kids could use the full circle or cut them up for more color variety.